As an open space to accommodate community events and recreational activities, Tom Hanafan River’s Edge Park sits on the Missouri River, creating a border between Council Bluffs, Iowa and Omaha, Nebraska. Artist Dan Corson recently designed a massive light show for the park, complete with complex characters and simple, intuitive interactive games that spans across the park’s five acres. HARMAN’s Martin Professional light fixtures were installed by Bandit Lites to illuminate the artist’s vision. Inspired by European baroque knot gardens, the ever-changing light environment showcases choreographed sequences and patterns every half hour. Additionally the piece interacts with visitors via thermal cameras and analytics program to track and “play” a series of simple, intuitive and fun games. The motions of park visitors can control the lighting and allow participants to be tracked with spotlights. 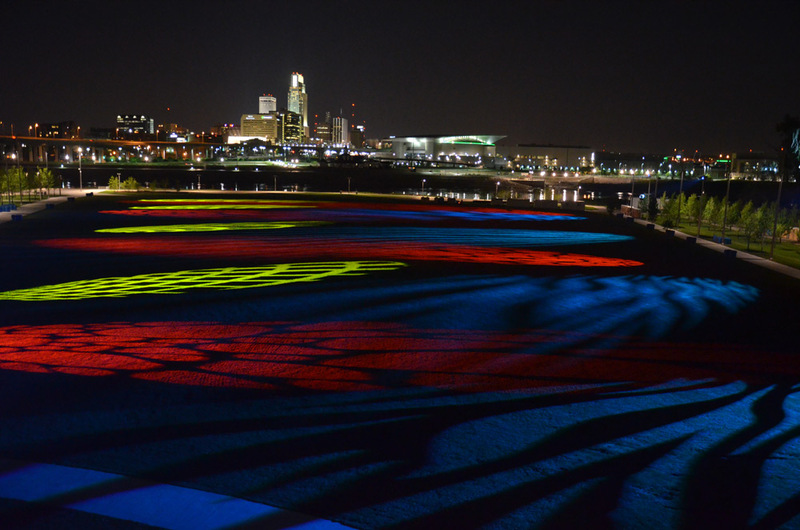 The light show has been calibrated to utilize a different color palate for each of the three “park seasons” of the year: White, Brown and Green, coinciding with the snow, dormant grass and green grass states of the lawn. A total of 16 Martin Exterior 1200 Image Projectors with custom gobos mounted on 35-foot poles and four MAC III Profile fixtures with custom gobos in Tempest enclosures mounted on 14-foot poles surround the 5-acre park to create the visual experience. A Martin MAX Module Cerebrum combined with a custom motion control system by David Beaudry of Beaudry Interactive runs the timing and interactive lightshow from a weatherproof station in the park.